A Connecticut College professor has told colleagues that his school has grown so hostile toward Jews that he can no longer recommend Jewish students or professors study or teach at the college. "In my opinion, this harassment of Jews on campus in the name of fighting for social justice should end; immediately," wrote Spencer J. Pack, an economics professor, in a faculty-wide email. His comments were triggered by the smear campaign that pro-Palestinian students successfully waged against a pro-Israel professor, resulting in his indefinite leave from campus, and a more recent push to malign Birthright (a program enabling student travel to Israel) by plastering the campus with posters. The posters reportedly intimidated Jewish or pro-Israel students and faculty, while attempting to poison the minds of uninformed students and faculty with vicious falsehoods about Israel. The posters were put up by Conn Students in Solidarity with Palestine (CSSP), whose faculty adviser, Eileen Kane, runs the school's Global Islamic Studies program. Kane's Global Islamic Studies program also invited Palestinian-American poet Remi Kanazi to speak at Connecticut College on April 12. Kanazi, who is scheduled to give a "poetry performance," is on the organizing committee of the US Campaign for the Academic and Cultural Boycott of Israel and listed among its endorsers. His strategy has been to connect anti-Israel politics with popular urban struggles. Making matters worse, Jasbir K. Puar also was invited to speak at Connecticut College. At a Feb. 3 talk at Vassar College, Puar unleashed a torrent of vicious anti-Israel lies and blood libels, including outrageous accusations about Israel harvesting Palestinian organs and conducting scientific experiments in "stunting" the growth of Palestinian bodies. Her Connecticut College appearance was scrapped, but Kane has ignored repeated questions about the invitation. Hatred of Israel and overall hostility towards Jews at Vassar has been amply detailed. More generally, campus hate against Israel and Jews has become an increasingly frequent and widespread problem thanks to the "Boycott, Divest, Sanction" (BDS) movement. Even Palestinians who aren't sufficiently critical of Israel are targeted by BDS. Bassem Eid, founder of the Palestinian Human Rights Monitoring Group, was directly threatened by anti-Israel protesters while lecturing at the University of Chicago on Feb. 18. More recently, the New York Post reported on the hateful harassment of Jews at four City University of New York campuses. Connecticut College seems to be moving in the same direction. Last spring, Connecticut College Professor Andrew Pessin was libeled and silenced in a campaign led by Students for Justice in Palestine activist Lamiya Khandaker. That campaign included condemnation of Pessin by scores of Connecticut College departments and affiliates, including the Global Islamic Studies program. The administration nevertheless gave Khandaker the "Scholar Activist Award." Then came the Birthright smear last December, the Puar invitation, and the scheduled talk by anti-Israel activist Kanazi, sponsored by the Islamic studies program. 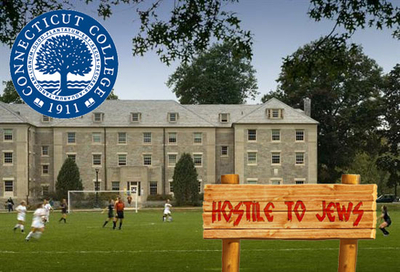 These developments reinforce the perception that Connecticut College is hostile to pro-Israel voices. Meanwhile, discussion of the Pessin affair continues as questions mount over the role and nature of the school's Islamic studies program. In a Jan. 26 email to fellow faculty members, Manuel Lizarralde, a professor of anthropology and botany, called the Pessin affair a "train wreck" and expressed regret at previously staying silent. "Why did we not have the Andrew defending his views?...We acted like vigilantes and found the perfect scapegoat," he wrote. In a Feb. 4, faculty-wide response to Lizarralde, Pack accused the Islamic studies program of organizing students to join the anti-Pessin campaign and then sponsoring "a new group on campus that [posted the anti-Birthright and anti-Israel] posters." That's when he called on the harassment to stop and indicated that he couldn't recommend Jews join the Connecticut College community. In response, Pack received some private support but wrote that "many, (perhaps most? ), of the faculty...are quite upset with me." Kane responded to Pack's email on Feb. 9, denying that CSSP is anti-Israel. But CSSP's posters smear the Birthright program with the label "settler colonialism," effectively demonizing any student participant in that program, and spread the blatant lie that that there are "seven million Palestinian refugees today." Even the pro-Palestinian United Nations Relief and Works Agency for Palestine Refugees in the Near East (UNRWA) claims that there are only five million Palestinian refugees, and that total is grossly inflated because UNRWA defines the term "refugee" to include all subsequent generations of the original refugee – a definition unique to Palestinians among all other global refugee groups. Posters vilifying students who want to visit Israel as "settler-colonists" and spreading blatant lies to undermine support for Israel would seem to be "anti-Israel." Kane did not respond to an email asking for her definition of "anti-Israel" after her claim that the group behind those posters is not "anti-Israel." Kane's faculty-wide response to Pack's email describes the Pessin controversy as "a heated disagreement over ... Pessin's Facebook post on the 2014 Gaza war." That's misleading, because it minimizes what happened. The "disagreement" was more of a mob-like character assassination that ignored Pessin's insistence that his words had been purposely distorted, the Washington Post article presenting evidence corroborating Pessin's position, and Pessin's immediate, polite apology to the student who first voiced concern. As if trying to resolve campus tensions, Kane asks "what are we going to do to advance informed, responsible discussion of the history and politics of Israel/Palestine on this campus?" But she may not be the best arbiter of what constitutes a responsible discussion; she can't even recognize that her student group's posters are blatantly anti-Israel. Kane's email notes that we are in a time "when Islam is widely misunderstood." One powerful way to reduce such misunderstanding would be to highlight Muslim efforts to reform the way Islam is practiced. But Kane also refused to say whether the Global Islamic Studies program has invited any speakers who advocate such reforms. When Pessin's wife, Gabriella Rothman, was asked about the few apologies that Pessin had received nearly a year after the events in question, she said, "It's hard to get too excited about it," given how duplicitous and dishonest so many of his colleagues and friends had been. Read Rothman's full comments here. Remarkably, the Connecticut College administration hasn't taken any initiative to protect students and faculty brave enough to espouse unpopular views. Nor has it issued any apology to Pessin, who has been forced out of the classroom for nearly a year in the wake of the controversy. To regain some of its credibility, Connecticut College should publish the results of an independent investigation into the Pessin affair and a detailed plan of how to avoid similar incidents in the future. so disheartening... Andrew Pessin is quite a guy! And he is working harder than ever now. TERRIFIC article. I don't know how I missed Phyllis Chesler's article - the first 'click.' But I do know that there's a problem with the article. ... [First paragraph]: Those 'parallel and corrective posters' that should be written and posted will probably not be. .. And of course, the books cited in the last paragraph will probably not be read by those who need to read them the most. 1) In fact, the parallel and corrective posters must show that Islam is the largest practitioner of both religious and gender apartheid on the planet. In addition, their history is one of ceaseless imperialism and colonialism, as well as anti-black hatred and slavery—all of which continue to this day. 2) Israel, to its great credit, protects the public worship of Islam, Christianity, and Hinduism; Baha'i fled from Iran to Israel where they lead modern and democratic lives. The same cannot be claimed of the Arab or Central Asian Muslim world. Let the posters proclaim this truth. 3) I would suggest that the five signatories of Connecticut College administrators read an excellent new book, just out, by Dr. Tawfik Hamid, a former Egyptian Islamist. It is titled Inside Jihad: How Radical Islam Works, Why It Should Terrify Us, How to Defeat It. I would strongly suggest that they also read all of Ibn Warraq's books, beginning with Why I Am Not a Muslim, Leaving Islam: Apostates Speak Out, and Why The West is Best: A Muslim Apostate's Defense of Liberal Democracy, as well as Bat Yeor's work about the decline of Eastern Christianity under Islam.